South Shields' Carl Finnigan is crowded out as Blyth Spartans get plenty behind the ball. Picture by Kev Wilson. 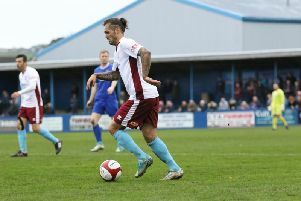 South Shields continued their preparations for the new season with an impressive performance in a 2-2 draw with Blyth Spartans on Saturday, writes Daniel Prince. The teams could not be separated at Mariners Park as National League North outfit Blyth came from two goals down in the first half to take a share of the spoils. Shields joint managers Lee Picton and Graham Fenton were left to reflect on a great deal of positives as their side more than matched their opponents for long spells. It was Spartans who came out of the blocks the quicker, though, with Dan Maguire finding the net within a minute. Fortunately for the Mariners, the flag was up for offside. Shields broke the deadlock in the ninth minute after some superb play by the ever-lively Josh Gillies on the right flank. He ran down the wing before clipping a low ball into the area for a trialist, who took a touch and picked out the bottom corner to delight the home crowd. The Mariners enjoyed a dominant spell after the goal and went close on a number of occasions. Former Shields loanee Pete Jameson did a terrific job in the Blyth goal to keep his side’s deficit at one, clawing away a Craig Baxter cross before denying a trialist and then watching a Darren Lough effort whistle past his post. He could do nothing to prevent the hosts doubling their lead on 20 minutes, though, as the pressure paid off. Gillies was again at the heart of it as he delivered an impressive cross from the right which Carl Finnigan nodded past Jameson to notch his second goal of pre-season. Blyth pulled one back in the 33rd minute when the prolific Maguire was played in on goal and made no mistake as he slotted past Liam Connell. Alun Armstrong’s team enjoyed their best spell after gaining a foothold. Former Shields players Alex Nicholson and Jamie Holmes combined for their next chance, with the latter denied by blocks from Baxter and Phil Turnbull. Holmes curled a later effort wide and Connell did well to save from Nathan Buddle, but Spartans got back on level terms a minute into first half stoppage time when a Connell parry fell to the feet of Michael Liddle, who blasted the ball into the net. Shields recovered their composure early in the second half, and went close when Baxter played in Finnigan before the striker saw his effort blocked by Buddle. Jameson did brilliantly to keep Blyth level just before the hour mark when a trialist was played through on goal and his effort was superbly kicked away by the goalkeeper. Robert Briggs was introduced at half-time by Fenton and Picton as he made his first appearance of pre-season. He almost marked it with an early goal of the season contender as he beat two men in midfield before beating Jameson with an audacious chip which just cleared the crossbar. Opportunities were harder to come by in the closing stages as both teams made a number of changes, but the Mariners almost won it in stoppage time. Chris Hunter chipped a superb ball over the top for Michael Colquhoun, who fired just over as the sides were forced to settle for a draw. Shields will hope to build on their positive afternoon when they take on Hebburn Town at Mariners Park on Wednesday. 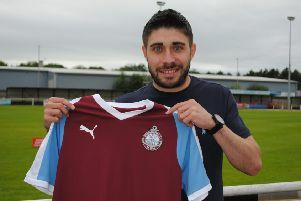 SOUTH SHIELDS: Connell (Stephenson 76), Baxter (Hunter 61), Lough (Trialist 46), Shaw (c) (Bexton 61), Morse, Turnbull (Trialist 61), Gillies (Judson 76), Trialist (Cowburn 76), Finnigan (M Colquhoun 76), Trialist (Briggs 46), Trialist (Smith 53). Goals: Trialist (9), Finnigan (20).